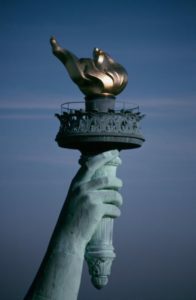 #1 is a poem by Emma Lazarus entitled “The New Colossus.” Its final lines are inscribed on the Statue of Liberty. #2 is a quote by Elie Wiesel, author of Night, Holocaust survivor, winner of the 1986 Nobel Peace Prize. #3 is Wendell Berry’s brilliant take on the Golden Rule. These quotes are about peace, and peace is active, not passive. We must take sides. We must treat people the way we want to be treated. Our country is already in a civil war, but I don’t see it as distinctly partisan. It’s ideological. In other words, it’s possible to be pro-life AND pro-poor refugees from shithole countries. (Just quoting the president here.) I don’t fit neatly in a red shirt or a blue shirt in this civil war. I just want everybody to have a shirt…and some basic freedoms. And sometimes we have to fight for freedom and peace, not just for ourselves, but equally for those downstream from us. So we vote…and almost all of the candidates are distinctly red-shirted or blue-shirted. We must pick from our choices based on our ideology. Too bad Lady Liberty isn’t a choice. I don’t see her standing in the harbor bearing a gun or a “keep out” sign.